One of the things I like best about living in Florida is that it’s a great place for a vacation, even if you live here. It seems no matter where you live, east coast, west coast, in the Panhandle or Southern Florida just a couple of hours drive in any direction and you can be somewhere that doesn’t look like home so you feel you’ve really gotten away from it all. The panhandle is fondly referred to as the Redneck Riviera with its emerald green water and white sand beaches. The west coast is a great place to go ‘island hopping’ with Sanibel, Lovers Key and all the other little places nestled there. The east coast is great for surfing, the small wave capital is here on our own Cocoa Beach and history, St. Augustine, also on the east coast of Florida, is the nation’s oldest city, but if you really want feel like you’ve gotten away head south. Southern Florida is truly a tropical place; the tropics actually start in south central Florida and it gets more lush and green the farther south you go. We have our own little tropical paradise known as the Florida Keys. The Keys are made up of many small islands and chains of island and are set at the tip of Florida so they lie in the Atlantic Ocean on one side and in the Gulf of Mexico on the other. Key Largo is the top and considered the first Key. Key Largo is the one made famous by the movie staring Humphrey Bogart and Lauren Bacall and the song. The waters around the Keys are warm and crystal clear this attracts many divers and snorkelers which lends to Key Largo having the popular moniker of the “Diving Capital of the World”. Islamorada is the next most popular spot to stop on your way down the island chain. Islamorada is actually made up of six different islands and has a reputation as The Sport Fishing Capital of the World. They have a fleet of extremely skilled recreational fishing captains who’ll be more than happy to go out with you for a day to see what biting. Islamorada is also famous for a place called Robbie’s Marina this is the place where they sell buckets of bait for feeding swarms of tarpon that hang out around the docks. It’s so much fun to feed them, I’ve done it. Islamorada is also famous for the opportunities they provide to swim with dolphins. 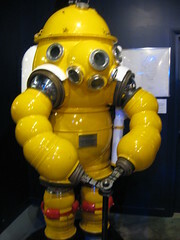 They also have a History of Diving Museum there which is pretty interesting. Another not to be missed place is John Pennekamp Coral Reef State Park. They are known as a great place for diving and snorkeling and have the only living coral reef in the continental United States. Over a million people come from around the world to enjoy the water, trails and camping facilities offered by the park. They also have the “Christ of the Waters”, a 19 foot bronze statue people dive all around, some even dive down to touch His outstretched hands. Marathon is considered by many to be the ‘middle’ of the Keys and the place of the world famous 7 mile bridge. Marathon, too, is a major sportsfishing destination; it is also a popular for spearfishing and they have an open lobster season during the year, Marathon is a great place to try and catch a few. Big Pine Key is just a short distance past the famous Seven Mile Bridge where the Keys take that gentle westerly turn and is considered the start of the ‘Lower Keys’. This is the place where you can come to relax its a little less crowded and more natural than some of the other Keys. Probably one of the biggest draws to Big Pine Key is the National Key Deer Refuge, home of the adorable Key Deer, the smallest of the Virginia white-tailed deer; they are in danger of extinction and are therefore federally protected. Bahia Honda State Park is another draw to the area. You can picnic, take a swim, dive the reef, snorkel the shallows or simply relax on Sandspur Beach voted #7 on the Travel Channels top 10 Florida beaches. Now for the Margaritas, Key West is known for margaritas and the best place to start is Jimmy Buffet’s Margaritaville. Other well known party spots include Sloppy Joe’s, Capt. Tony’s and Hogs Breath, But for my taste I’ll choose Sloppy Joe’s with 21 different types of Margaritas to choose from. Key West is considered by some to be the crown jewel of the Keys but I don’t think that’s really fair considering its ALL good. Key West, however, is THE place to party in the Keys. Duval Street is famous for their bars and history, Mallory Square is famous as a place to enjoy the sunset and ensuing party that happens every night. The street vendors and performers are a sight to see. Every year around Halloween, Key West hosts Fantasyfest a party where people dress up and dance in the streets, its wild. The Keys are a great place to get married, have a honeymoon or a family reunion. You can dive, snorkel, fish or just lie on a beach and relax anywhere and everywhere in the Keys. You can dance and party the night a way, shop at one of the unique, quaint shops, or have a fabulous meal at one of the outdoor cafes all while enjoying a fruity tropical drink. In this day of people vacationing closer to home we Floridians are truly blessed to have such a beautiful Caribbean-style place to come visit without ever leaving ‘home’. For the most fun places to go and things to do in Florida, just head south on US 1 down to our little piece of paradise, the Florida Keys. Swim with dolphins, snorkel, go fishing or just enjoy the crystal clear water. Are you looking for the best place for fishing enthusiast like you? Searching for a perfect location for sport fishing and other fun activities? Various places boast of varieties of adventures and rare finds. Some popular locations take pride their steep mountains that are perfect for trekking. Others have caves for spelunking. And when it comes to water sports and offshore fishing, Florida Keys is known to be one of the best places to visit. Florida Bay has enriched marine shelter, thus making it suitable for various sport fishing and the best of Florida Keys fishing charters offered to all marine enthusiasts and tourists in the area. It also has a vast variety of fish, in fact, more than you will find in most waters. You will also get the bigger fish in the different species and be able to brag about your catch for years to come. Deep sea fishing in the Florida Keys is the first thing that everyone has on their list of activities when they go to Florida. This activity is probably the most exciting thing to do when in Florida Keys. It makes one feel like chasing down giants like sharks and Marlins. Boarding into a great charter, hunting big fishes, catching and keeping your catch, going for big tackles: all these exciting and fun things may happen on a single fishing trip for a deep sea fishing, which will definitely turn the adventure a worth remembering event in anyone’s life with all its colors and flavors. This is the most popular tourist activity in the area that tourists and residents would not want to miss out. This fishing activity is perfect for a group of friends, co-workers, a family or even just a single individual who wants to learn how to fish and experience catching one. Deep sea fishing is considered a sport where both professional and amateur fishermen embark into the deepest parts of the water in search of a catch. This sport provides fishing opportunities for everyone from amateurs to professionals. It does not matter if this is your first time as there are professional fishing guides who will teach you adnd lead you through out the whole trip. There you’ll find a team of professional guides and experienced captains to guide you through in your fishing spree, taking you to some great and popular fishing spots and even helping you catch fish. Aside from this, there are also companies in the area that offers fun filled trips and adventure packages which include boat rentals and charters with the best fishing guides in the Florida Keys. If you are planning to visit Florida Keys to try their fishing sports make sure to start in finding the right company and excellent sport fishing guide to help you book your trip. There you’ll find companies in the area that provides all you need from fishing guides to boat rentals in Florida Keys. With proper accommodations and an excellent sport fishing guide, a visit to the Florida Keys and surrounding areas could definitely be considered as an adventure itself as people engage into the excitement and thrills of interacting with live fishes and using high tech equipment for catching all sorts of fish while riding on a great charter with the best guides and captain. There are many things you can discover in the Florida Keys, one is trying a offshore fishing trip. The time that you spend on both the actual fishing time are of great pleasure, as with any time spent on the sea you will find that this is a truly relaxing vacation from everything. At the end of last year I had the privilege of taking Patrice Etlin on an epic spearfishing adventure for his 50th Birthday. No one could have in their wildest dreams have imagined the magical ending they had. It was incredibly special and it was awesome just to have been part of the whole thing. Here is the final video put together by the ITZ team and Rich Leonard. 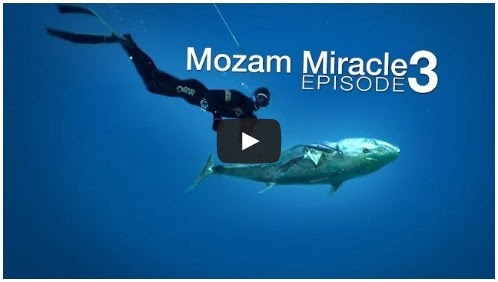 This has to be the best representation of what a good spearfishing trip with an unbelievable fish is. If this does not make you smile then nothing will. Little things make a good hotel great. Whether it’s a five-star, ultra-luxurious beachfront resort, or a humble B&B tucked away in a quaint residential area, small touches that show an extra bit of care on the part of the owners and management for your guest experience really do add up. Small touches like this porch swing. I found it on the upstairs balcony of my super-swanky villa at Deep Water Cay, the formerly all-boys private island fishing enclave in The Bahamas that’s recently evolved into an upscale escape catering to families, couples, and really all types of well-heeled travelers, be they into fishing or not. Like all the other furniture in my villa, and elsewhere around the property, the porch swing was of an extremely high quality. Manufactured by Kingsley-Bate, purveyors of America’s finest teak furniture, the St. George swing exudes luxury in its classic styling and solid construction. None of that makes this the best seat in the house at Deep Water Cay, though. The little thing actually making all the difference here to me is its placement, the seat hanging just below the top of the balcony railing enabling all who sit here to enjoy unobstructed views of the surrounding waters, islets, and amazing sunsets like these. Ever walk out on your hotel balcony and settle into a comfy chair only to find that your view is obscured by the safety railing? It’s a common pet-peeve of mine that I’ve counseled hotel clients and hotelier friends about on many occasions over the years, always complaining that they should outfit their balconies with taller chairs. You’re reading Best Seat in The House at Deep Water Cay, The Bahamas from Uncommon Caribbean – The Insider’s Caribbean Travel Blog. If you’ve enjoyed this post, be sure to follow Uncommon Caribbean on Facebook, Twitter, and Google+. Bait fishing rigs with lights, spinners, and the short wires which are mostly used by fishermen as live bait since many years, and in this piece of writing, I will notify you of a number of bait fishing including bait a more natural approach. The type of rigs of bait fishing with lighting and the like having their place in the fishing group of people, particularly when it mainly comes to stuff like go back to trolling of walleye. A large amount of effective and natural way to fish with live worms and live baits, in particular, is bait fishing fit or a set of hooks. A series of hooks is only a few small hooks tied in bike, creating a live worm to be obtainable in a completely effective and natural way. It makes a large difference, particularly with larger and more skilled fish. It’s not a huge difference with the tiny “bait thieves”, except that the slighter hooks will guide you hook more “bait thieves” also. The key is that when it comes to rig of bait fishing mob hooks is very good as it obtains, particularly in the “normal” circumstances of the fishery. As a substance of truth a live worm can be fitted on a set of hooks, and can flow with the organic flow of a river, bouncing off the base as it runs, is a very lethal method for lots of kinds of fish. Remember that a living worm (or other live lure) should be as much as it looks in nature as possible. The natural loom to life bait fishing is very effective. Bream fishing is huge in Australia, from its unassuming statue of bream fish quickly became a symbol of Australia. Bream fishing is also known as bream run when it is done using only lures on lightweight graphite rods with 2-4 pound wheels spin. Bream fishing in general is very much capable of becoming frustrating in targeting fishes as most of the time you can even see them in water or fish finder on your boat, but they will not provoke. They can even be taken throughout the year, but the unusual seasons will surely influence their eagerness to obtain lures. Fishing is really much admired water-based sports. In actual fact, it even ranked as one of the top 10 America’s much loved recreational activities. Fishing boats can be more access to water and different circumstances and different types of fish landed. It even gives you the opportunity to explore a wider coverage of the fishing area. One of the most dangerous activities of fishing is offshore fishing and this necessitates a specific boat. If you mean a fish for sea, catching fish with a large and heavy tackle then this offshore fishing is your activity of option. However, this type of fishing cannot be performed without risks. In reality it is one of the most dangerous than fishing in shallow water. You should have information about the weather and navigation goes there in open sea. It is no fishing activity for beginners. Offshore fishing requires more extra and skill safety measures such as wearing life jackets on board. best mono line for release SG reel? using it for bottom fishing, it has 30# of drag. i was going to put 30# mono on it, but was wondering what mono is the best? Located at the southern tip of Florida, Florida Keys is one of the popular tourist destinations in the United States. If you’re dreaming of a relaxing vacation near clear blue ocean while holding a margarita in your hands, you might want to consider visiting Florida Keys tourist attractions. You’ll be surprise of the many wonderful places you can visit in this area. The great thing about the attractions you’ll find in Florida Key is that it gives a laid-back ambience. This is a great place where you can truly relax and leave the worries of the real world. Look forward to various activities when you visit Florida Keys. Shipwreck exploration in the reef, salt-water fishing and experiencing cultural events are just some of the things you can do when you visit Florida Keys tourist attractions. If you enjoy the marine life, you’ll definitely have fun vacationing in Florida Keys. Enjoy the Tuna, Bonefish, Sharks and Snapper when you visit Florida Keys. Even if you are a beginner, you can still experience Florida Keys’ “hand at deep-sea fishing” with their guides and charters that are always available to guide you. Backcountry fishing is also famous in Florida Keys if you are a pro who is interested in testing the water. You can also experience the marine life in Florida Keys through various water activities, such as diving and snorkeling. Through these activities, you will definitely adore the view of coral reefs and shipwrecks. Even if you have no experience in these activities, you can still enjoy it because Florida Keys tourist attractions offer training for novice divers and snorkelers. Florida Keys is not only for marine lovers. Those who prefer land activities can also enjoy this tourist destination. The Florida Keys is also famous for their cultural events and other land attractions. Some of these include Paradise Ballet Theatre, The Studios of Key West, Key West Symphony Orchestra and The Tennessee William Theater. For art and culture lovers, Florida Keys tourist attractions can definitely offer you the best in the country. So if you want to have a vacation worth remembering, be sure to visit Florida Keys. With its famous tourist destinations, it is no wonder why many tourists visit this location. Want to know more about Florida Key Tourist Attractions. Visit Michael Harrah’s page http://floridatouristattractions.org/reports.html now!